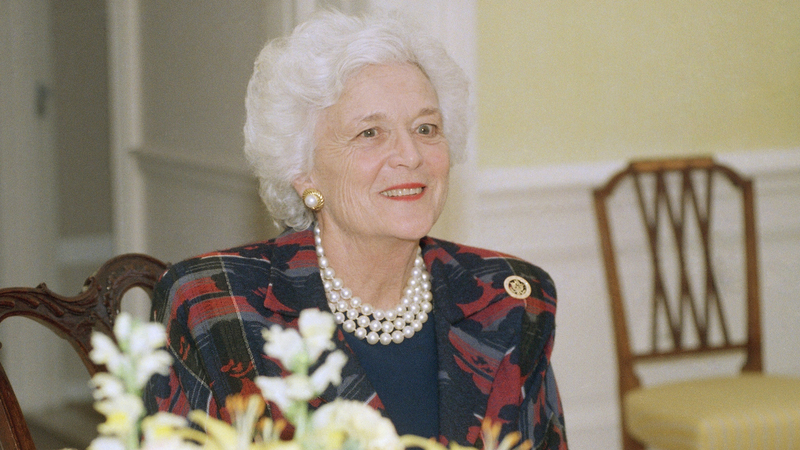 Barbara Bush On Meeting George, Motherhood And Her Signature Fake Pearls The former first lady, who died Tuesday, told Terry Gross in 1994 that she grew up thinking she'd be a nurse. "But then I met that marvelous George [H.W.] Bush and the nursing went out the window." Barbara Bush (shown here at the White House in 1989) met her husband, former President George H.W. Bush, at a dance when she was 16. Former first lady Barbara Bush died Tuesday after a series of hospitalizations. She was the wife of former President George H.W. Bush and the mother of former President George W. Bush. Born Barbara Pierce in New York City, Bush initially thought she'd grow up to become a nurse. "But then I met that marvelous George Bush and the nursing went out the window," she told Fresh Air in 1994. The Bushes settled in Midland, Texas, where Barbara became a stay-at-home mother. Her husband's work often required him to travel, which, she said, put pressure on her to be both "mother and father sometimes." "I remember thinking at times, 'They're wonderful children — they're beautiful and they're brilliant — but they haven't said one thing that makes them fascinating all week long.' Well, every mother feels that," Bush said, "but it's worth it." In the 1970s, with her children grown and her husband heading up the CIA, Bush experienced severe depression, which she wrote about in her 1994 memoir, Barbara Bush. Looking back on that period, she said, "It was an awful time. But having said that, I'm now much more sympathetic to people who have problems, and I really feel free to say to people, 'Get help. There's help out there.' "
Later, when the her husband was elected president, Bush made headlines for rebuffing pressure to color her white hair and unabashedly wearing fake pearl necklaces. "I wouldn't want them if they were real," she said of the pearls. "They're sort of fun, and, besides that, they're big enough to cover my wrinkles." He asked someone to introduce me to him and we then became friends. ... I was a good dancer. He was not a good dancer. In those days, you went to a dance with — either you just went or you went with a boy, but he did not expect to dance with you all night. You expected to dance with other people. And when George did dance with me and they suddenly started to play a waltz and George said, "Do you mind if we sit down? Because I don't know how to waltz." And we did sit down and talk. And he came to a party he knew I was going to be attending the next night, and it sort of went on from there. You'll always hope there'll be a cure. ... It was hard on her, and certainly hard on George, who had to keep on in business and work. It was hard on me and our family, but on the other hand, if you ever give up hope you give up living. I do remember when one of the children, or two of them, had their tonsils out, someone saying to me, "Oh, well, after what you've been through, tonsils are nothing." I said, "Well, after what I've been through, tonsils are worse than ever." Thank goodness for George [H.W.] Bush, because he believes in independence and he always gave the children independence and he would trust them. And when I would think they were maybe more like me — that they shouldn't be trusted or something — he would say, "Of course they can drive across the country when they're 16. They have their license." I would panic, but they did it. And they're great kids. My belief is that unless you're courageous enough to run for office yourself, you can tell your husband or your wife what you think quietly in your own private time, and then you present a united front. I really don't think the party platform matters. That's not a good thing to say, but I can't remember a word the Democrats said. I can't remember a word the Republicans said. I think platforms should be very broad-based and inclusive — not exclusive. George always said, "You're great the way you are. Don't try to change." As a little girl, my dad used to say all the time — he used to embarrass me to death as I'd go out the door, maybe with a date: "It's nice to be natural, and you're naturally nice." I wanted to kill him because I was hoping to impress someone with how sophisticated I was. But having said that, that's probably true. I decided that, after a little struggle, that I would not try to be something I wasn't. Bridget Bentz, Molly Seavy-Nesper and Nicole Cohen adapted this interview for the Web.